There’s a fine line between baker and mad scientist. And I’m walkin’ that line. I hate to fail. Hate it. And when the sourdough starter recipe from the Amy’s Bread cookbook failed miserably—TWICE—I was a volcano inside. Watch out, sourdough … I’ll get you yet. The Amy’s Bread sourdough is, as I envision it, the sourdough the pioneers relied upon. They didn’t have a packet of Fleischmann’s Active Dry tucked into their bonnets. They used yeast, baby … real yeast just floating around in the air or found on … things. Like grapes. This is where I stop envisioning – I don’t want to know what else they used as yeast sources. The Amy’s Bread sourdough used grapes as the yeast source. Organic grapes. Well … Okay. This is where I admit I went wrong with the recipe. I used conventionally grown grapes, not organic. I went to two or three different Whole Foods! Even the HUGE one in Legacy Place – nada! According to one produce manager, organic grapes are sparse this time of year. Conventional grapes didn’t have that yeasty bloom. What else could explain my lack of bubbling? I didn’t go too crazy in my problem solving. I just looked around and picked what I thought would harbor the most yeast. I chose an organic apple. I figured that, while the smooth part of the apple would have been wiped or polished in some way, the indentations on both ends of the apple would have something native still hangin’ out in there. Now that I think about it, I bet an organic fig would be a good bet, too. I added 113 grams of 75F-78F water, 72 grams all-purpose flour to a quart container. I chopped the apple into about a 16 pieces and added mostly the end sections to the other ingredients. Stirred vigorously. Put the cover on. Heated some water in the microwave to create a warm environment. Put the container inside at around 3pm on Sunday. Monday: I checked on the dough periodically throughout the day. Small bubbles started to appear around the apple chunks. Pockets of liquid appeared later on. Lines of bubbles and flour appeared through those pockets. I heated the water about three times during the day to maintain a warmish environment. Hmm … could this possibly be working? 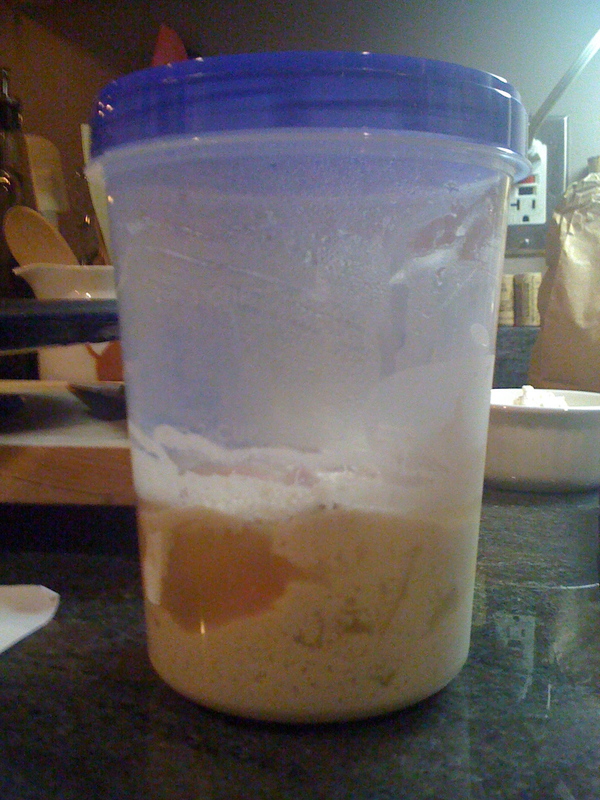 Tuesday, 5:57 a.m. 39 hours later, there’s definitely yeast activity in the container. The bubbles are bigger with the mixture. And there’s small bubbles – like someone took a straw and blew bubbles – on the surface. And, it smells like fermenting apples. Good sign! I stick an instant-read thermometer into the mix and it reads 70.7F. Not bad. Plus, when I pull it out, the substance is a bit gooey and pulls up with it. Yay!! I move on to the next step – my first refreshment. I add 113 grams of 76F water and 72 grams of flour. Stir vigorously. Close container. Stick in a warmed microwave. Cross fingers. 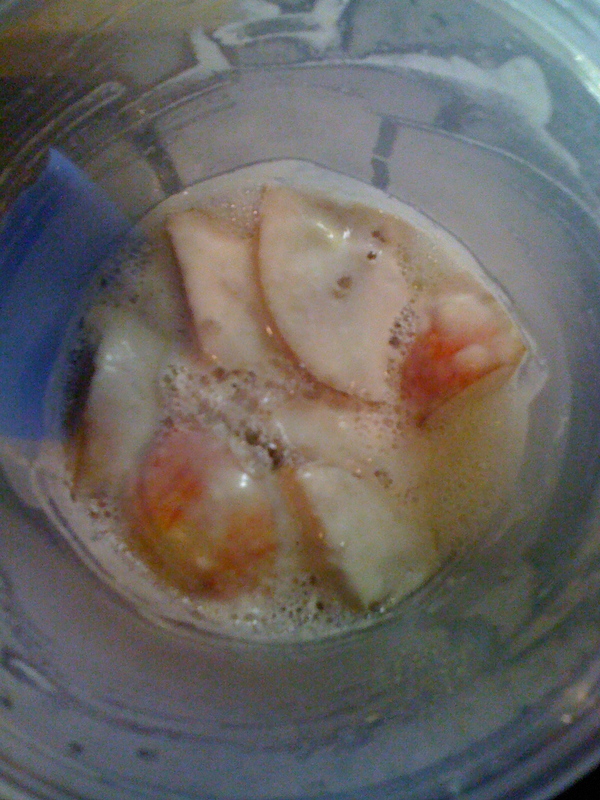 The sourdough with apples begins to bubble. You are currently reading Obsessing with Sourdough Starter at The Dainty Dot.